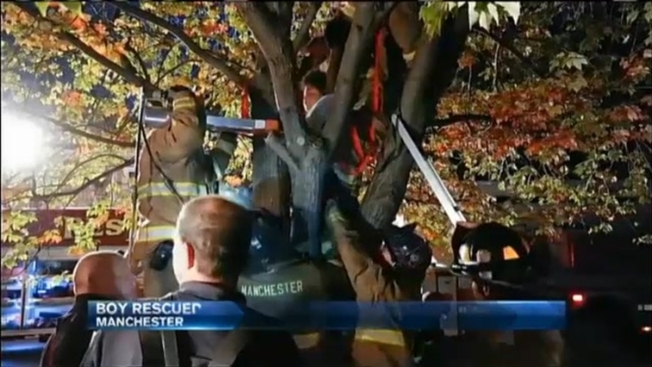 Officials say New Hampshire firefighters freed a child who got stuck in a tree using a tool commonly known for prying open vehicles to free people trapped inside. District Chief Michael Gamache says a 9-year-old Manchester boy became stuck Monday night while watching fire trucks in response to another call. Fire crews found the boy at least 12 feet up in the tree and wedged between two foot-long branches. Firefighters tried lifting him straight up, but it was hurting the boy. They ultimately used the Jaws of Life to spread two large sections of the tree apart and free him.